The KSM32's frequency response doesn't confine it to being strictly a vocal microphone. The SPL handling goes as high as 154 dB with the -15 dB pad, so you can set this microphone in front of a bass or guitar amplifier without worry of distortion. It also works well as an ambient room mic, kick drum mic, or even paired up as overhead mics on drums or a choir. Aside from the -15 dB pad, the KSM32 offers switchable rolloff settings of -6 dB per octave below 115 Hz, and -18 dB per octave below 80 Hz. These filters are helpful for recording vocals, guitars, and mid-to-higher frequency percussion, to weed out the lower unwanted rumble these instruments tend to have around 100 Hz. With the filters off, the KSM32's frequency range goes as low as 20 Hz, so you can grab those lower frequency instruments -- like bass or kick drum -- when you want to. Built with class A tranformerless preamplifier circuitry, the KSM32 has a low self noise of only 13 dB. You'll be able to get that tight and dry sound from a professional vocal booth without any unwanted noise. The Mylar diaphragm is ultra-thin and is very light -- providing a great transient response and true-to-life sound. Also, with the included shock mount, this microphone also works great on stage as well as in the studio. - Dimensions: 55.9 mm (2.20 in.) maximum body diameter, 187 mm (7.37 in.) long. - Net Weight: 490 g (17.3 oz. The Shure KSM32 is a side-address, cardioid condenser microphone for highly critical studio recording and live sound productions. It offers an extended frequency response for an open, natural sounding reproduction of the original sound source. This review has been selected by our experts as particularly helpful. 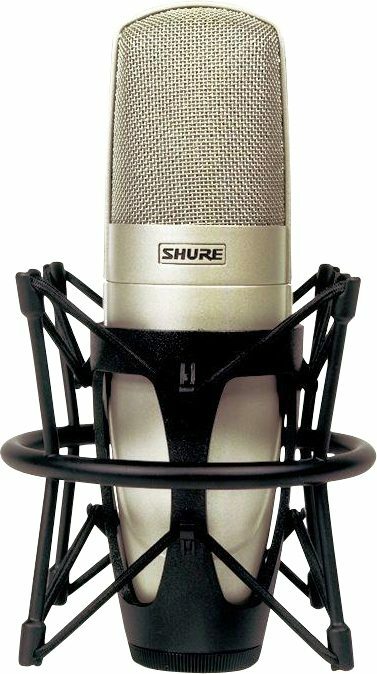 "Shure KSM32 Studio Condensor Microphone Review." Sound: I own two Shure KSM32 studio condensor mics. It has a very natural sound. I bought them because when I used some Audio Technica Midnight Blues to record a band, I noticed bass guitar was missing, and also the bass drum. The frequency response curve of the KSM32 indicates it has very flat bass response. I used them on four concerts and the bass drum sounds awesome on the recording, the spectrum analyzer in Adobe Audition measures it at 54 Hz. The high end is there too, and it produced an astoundingly clear recording, of a xylophone/barred percussion. I recorded also mandolin and banjo and the bright "plucking" sounds are very delightful. I recorded a marching/concert band, and the trumpets were very nice and bright and clarinets very smooth and natural, tenor sax came through fine. The bass response of this mic, picking up wind noise outside, will rip the cones off of your speakers! The only reservation I have, is with voices, sometimes, depending on the distance, the voice will sound "whistly" or similar, at a high frequency, on certain consonants, such as "f" or maybe "s". However, it usually is very natual sounding, but not overly "warm" like SM58 or AKG D190ES. Running into a Tapco/Mackie 6306 mixer/preamp to Sony CDRW66 24 bit AD optically coupled SPDIF into 2.68GHz PC running Adobe Audition. Shock mount ez to use and very effective in isolating the microphone. My bass pickup problem solved for the time being. Have to try low "E" on the bass guitar and some pipe organ. Much better than AT Midnight Blues for bass (the AT are voice mics so that should be expected!). They don't have much hiss but when it is quiet they seem to emphasize bass ambient noise if anything, I am talking -60dB or so. As read on VU meters, I can at home studio achieve about 60 some dB SNR and without more sound proofing that is it. That is, ambient noises including computer fans etc. are becoming the dominant factor. This is a good mic, well built, solid feel, reliable, it works fine. To make it perfect they should smooth out the bumps in the high end response to eliminate the slight "buzziness" or "whistling" on voices. This characteristic sounds great on mandolin/banjo though, its not a negative thing on the instruments. Feature: Elastic shock mount works fine, easy to use, reliable. I only use the shock mount, have not used the swivel mount. I don't use the -15dB attenuation switch, the sound would have to be massively loud to require its use. Wish it had omni pattern for flatter bass to 0 Hz but that is somewhat academic. Noise is low enough and not much of a factor. Quality: This is top quality fit and finish, there is no doubt it will work. Cables are more likely to break, not this mic. The carrying case is not a true road case and will scratch and dent easily. Manufacturer Support: They have a good web site, did not need any interaction with them. The Wow Factor: It has wide frequency response, it hears everything. Overall: Need a more "warm" or more "smooth" mic for vocals, to hear velvety smooth soft warm singing voices. This mic is "natural" not "warm". Some clients may prefer more "warm" = emphasized midrange sound. They must smooth out the high frequency response. I did not think this would be noticable from the curve, but it IS noticeable, only 3 or 4 dB; our ears are fantastic instruments. Style of Music: Church woodwinds, concert and marching band trumpet and woodwind. Overall: I just bought this microphone a few days ago! I used it in our studio on my dobro and I'm well pleased with it! All I can say is for the money, it's a MUST have. It's a killer instrument microphone! I finally got the sound I've been searching for! The Shure KSM 32 is AWESOME!